Classroom training started with a video, followed by questions and answers, hands-on training on demonstration walls, and a written applications test. 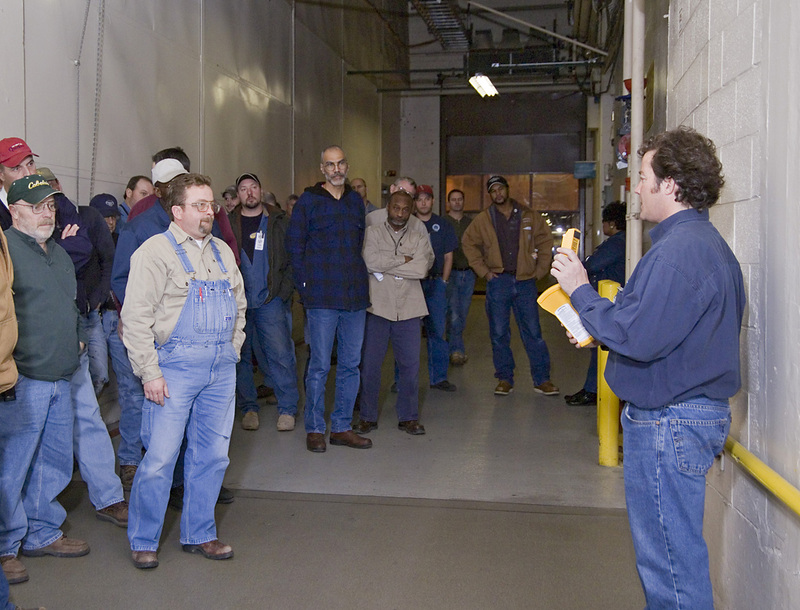 Zircon has received requests for training at large industrial complexes around the country because the safety departments now require workers to fill out a form certifying that they have scanned the wall, floor or ceiling before workers penetrate these materials, whether they are concrete or drywall. 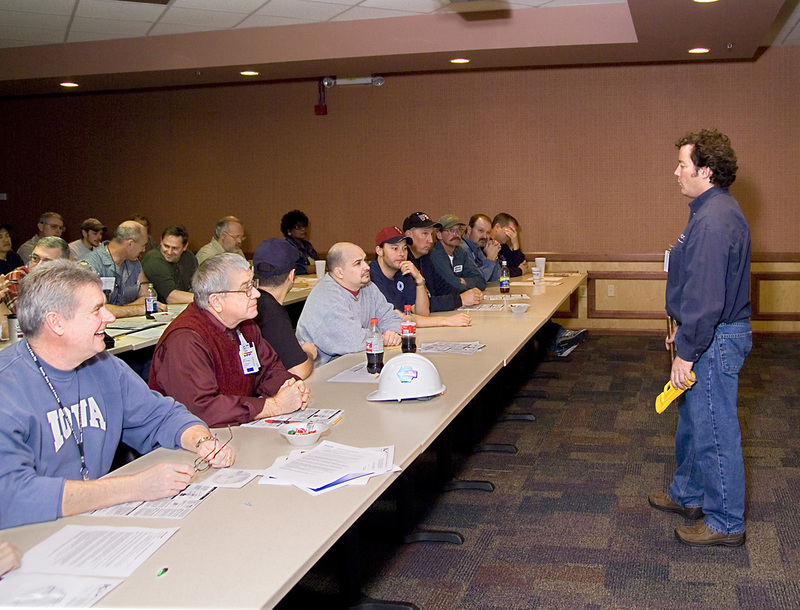 As these photos show, I conducted classroom and hands-on training for subcontractors who work at a Department of Energy (DOE) site managed by Honeywell, near Kansas City. 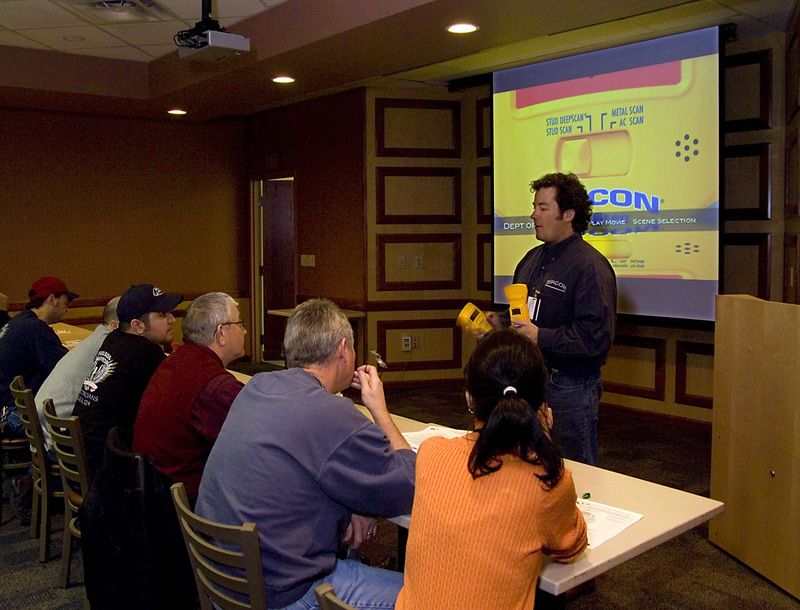 Each attendee was trained in the usage of the Zircon MetalliScanner MT6 and the Zircon MultiScanner i500. At the end of the training session, the attendees received a certificate after demonstrating basic proficiency in operating the MT6 and the MultiScanner i500. The head of the safety department personally researched and tested various brands of metal detectors for concrete and multi-function wall scanners (stud finders) for drywall. He could have selected different vendors for each category, but Zircon was selected to fulfill both goals based on the performance of the tools, and especially because of their ease of use. Before starting the classroom training, I was asked to demonstrate the MT6 onsite, as this would get the men excited about the capabilities of the MT6. At the onsite location, inside the wall behind me, there were high voltage electrical lines, but they didn’t tell me that. I was easily able to locate and trace the power lines inside the steel conduit by using the MT6. Of course, conduit offers some protection in many cases, but if a worker core drills through the wall in that location, it would cut through the conduit (and high voltage lines) like a hot knife through butter! The workers were thoroughly impressed with the performance of the MT6. (They want to get home safe every night)! The class laughed when one guy commented on how surprised he was that the MT6 works so well, considering how inexpensive it is. I recently did a similar training at an Intel Chip Fab facility in Arizona and they selected the Zircon MetalliScanner MT6 and the MultiScanner i500. One comment I hear repeatedly is that they knew about Zircon stud finders, but they had no idea Zircon also made such awesome concrete scanners! (Note: Cameras are not allowed inside the high security DOE facility, but the photos were sent to me by a DOE staff photographer). Zircon’s in the Real Blogs also provide a service and training perspective on popular subjects, such as the blog, “Does it Have X-Ray Vision?” For additional insights, please also visit us @zircontools, like us on Facebook or ivsit http://www.zircon.com. Here’s the third in the new blog series from Zircon Tool Pro!